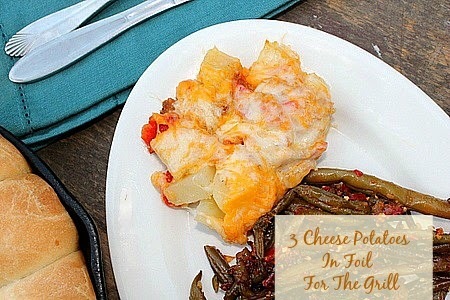 3 Cheese Potatoes For The Grill...You're going to love how easy and delicious they are! There are definite advantages to living in the country, one of which is the gorgeous natural beauty that surrounds me, which allows us to have our large garden. The disadvantages are few and would include the internet service. It's spotty at best on a good day, but when you have a week where it basically doesn't work at all, it makes a food blogger want to pull her hair out! That was my week. Today it's working enough to bring you this delicious potato recipe. This is a "spend less time in the kitchen on a hot summer day recipe" that is so easy to make and yet absolutely wonderful. Paul puts the foil packet of potatoes on the grill first as they have to cook about 18 minutes on both sides on low to medium heat.. He starts the meat, in this case chicken, when he's ready to flip the foil packet over for the second 18 minutes. Right before the chicken is ready we open up the packet and add the cheeses, close the lid and let them melt. It doesn't get any better or easier than that! I'll be making these all summer long and into the Fall. I hope you love them as much as we do! Enjoy! 1. Grease the double thickness foil ( about 18 inches square ) with shortening. I have also used regular foil doubled and greased. 2. In a large bowl combine the first 6 ingredients together. Place the mixture on the foil, dot with butter and fold foil up around the potatoes, seal tightly. Place on low to medium heat, grill for about 18 minutes on both sides with the lid down. 3. 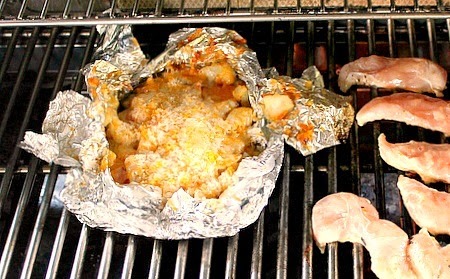 Carefully open the foil packet on the grill and add the bacon, mozzarella and cheddar cheeses. Grill 3 to 5 minutes longer to melt cheeses.